Top-To-Bottom Deluxe Cleaning – Done Right! Home/House Cleaning Services/Top-To-Bottom Deluxe Cleaning – Done Right! It’s our job to help you choose the right level of service for your needs. Choosing the right type of service to be performed in your home is the only way to have a successful outcome when you hire a cleaning service. If you insist on purchasing less service than you need, you will be disappointed with the results no matter who you hire. It is for this reason, that we strongly suggest that you start with a Top-To-Bottom Deluxe Cleaning for your first service visit. A Maintenance General Cleaning is only recommended if you’ve have professional cleaning within the last four weeks. 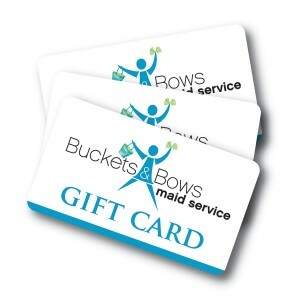 At Buckets & Bows we’re creating free time for busy people. We’ll focus on your house while you focus on your free time, allowing you to spend more time with activities you enjoy, and time with loved ones, family and friends.